167 years ago, on January 24, 1848, a carpenter working at a mill in northern California made a discovery that changed American history – two gold nuggets. Upon hearing the rallying cry, “there’s gold in them hills,” within a year, tens of thousands of people (popularly known as ‘49ers) traveled to California expecting to become rich. 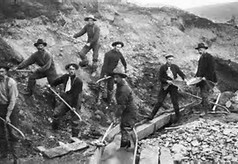 Many failed, a select few experienced success, but nearly all of the prospectors faced severe hardships during their fortune-hunting days. The California Gold Rush gives us a contemporary parallel to today’s “Population Health Rush;” those who cannot learn from history are doomed to repeat it. The Gold Rush was the largest mass migration in U.S. history, with more than 300,000 new arrivals by the mid-1850s. Most of the men who flocked to northern California needed to buy food, goods and supplies, which San Francisco’s merchants were happy to sell them at a handsome profit. Merchants made fortunes while most ‘49ers struggled. Stuck in a remote region, far from home, many prospectors coughed up most of their hard-earned money for the most basic supplies. At the height of the boom in 1849, prospectors paid usurious prices for basic supplies. In today’s dollars, a single egg could cost the equivalent of $25, coffee went for $100 per pound and replacing a pair of worn-out boots could set you back $2,500. As the boom continued, many exited the gold-hunting business to join businesses catering to prospectors. Some of America’s greatest industrialists got their start in the Gold Rush. Before John Studebaker built one of America’s great automobile fortunes, he manufactured wheelbarrows for Gold Rush miners. Two entrepreneurs named Henry Wells and William Fargo moved west to open an office in San Francisco, an enterprise that today has the largest market capitalization among America’s banking institutions. One of the biggest mercantile success stories was that of Levi Strauss. A German-born tailor, Strauss arrived in San Francisco in 1850 with plans to open a store selling canvas tarps and wagon coverings to the miners. After hearing that sturdy work pants – ones that could withstand the punishing 16-hour days regularly put in by miners – were more in demand, he shifted gears, opening a store in downtown San Francisco that would eventually become a manufacturing empire, producing Levi’s denim jeans. The concept of population health management is directionally correct. Our industry does need to and will, over a period of many years, make its way to managing the health of populations of people. In the early 1990s hospitals were in a rush to acquire physician practices to vertically integrate in preparation for global capitation. This monumental payment shift never materialized, so many of those practices had to be divested or jettisoned. Now, more than 20 years later in another cycle of consolidation and physician employment, most health systems still lack the scale, analytic competencies, connected information infrastructure, cultural readiness, governance, physician leadership and incentives to deliver optimal value-based care for even small patient populations such as their own employees. Gold Rush-era businesses such as Levi Strauss, Wells Fargo and others remain viable today while tens of thousands of gold prospectors died in poverty. Today’s health system leaders might consider applying lessons demonstrated by the Gold Rush merchants: while peer organizations are exhibiting organizational hubris about their new ACOs and future ability to profit from taking on global financial risk, first figure out how to achieve and sustain growth of revenue and contribution margins. Learn how to reduce practice pattern variation, demonstrate real patient-centered care and manage your operating costs to achieve breakeven on government reimbursement. While it may not be glamorous or occupy headlines, there is a ground game being played out right now in hundreds of markets across the United States. The winners will emerge as those most ready to profit under tomorrow’s value-based care models, especially as the next five years involves continued prevalence of fee-for-service payment models.